For the filling: Heat the oil in a frying pan and sauté the onions until lightly browned. Add the curry paste and cook until the mixture is fragrant. Add the minced chicken and curry leaves and stir-fry until chicken is cooked. Season to taste. Dish out and set aside. To prepare batter: Combine the flour and coconut milk in a mixing bowl and mix with a wire whisk. Add the water gradually as you continue to stir. Mix in the egg, cooking oil and turmeric powder Strain the mixture. To bake: Brush 2-3 muffin pans (the smallest you can get) with cooking oil. Pour the batter into each individual mold until three quarters full. 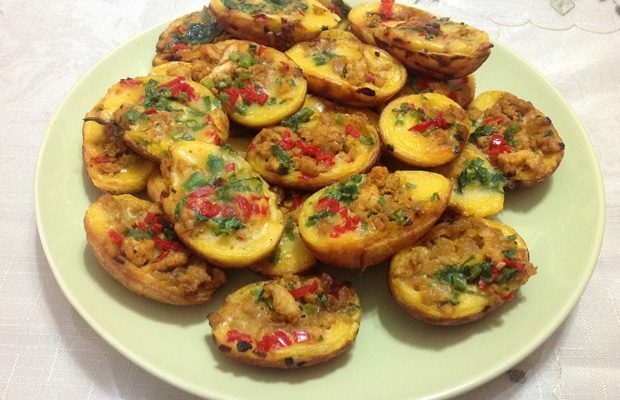 Place a teaspoon of chicken filling on the batter and top with a sprinkling of chili, spring onion and shallot crisps. Bake at 350 F about 10 minutes, until brown and well set. This recipe makes about 25-30 pieces, depending on the size of your muffin pan. Kuih Cara Lauk translates loosely to Filled Cake. Considered a light meal, it is usually sold at hawker stalls throughout the year, but is most popular during the Muslim month of Ramadan, when fasting Muslims buy it to break their fast.